Just the Right Size: Big, Fat Juicy Ones! I’m gonna eat some wor-or-orms. Itsy, bitsy, fuzzy, wuzzy wor-or-orms! Well, this past week, my friends, I ate some big, fat, juicy worms. First, they were gently poached in a sea-salt seasoned (nice alliteration!) bath. Next, they were generously tossed with some homemade pasta sauce, courtesy of Marcella Hazan, “The Essentials of Classic Italian Cooking”. Finally, they were dusted with freshly grated Romano cheese, and eaten with gusto. Yum! Are you kidding me? Actually, I decided to make gnocchi from scratch. Remember the roasted turkey from last week? Well, you have to have mashed potatoes with roasted turkey, which left me with said leftovers for gnocchi. Marcella describes how to roll the gnocchi dough on the back of a fork and then finish with some sort of flicking action, but I didn’t get the hang of it. My gnocchi came out looking like worms. If fact, I commented they looked so much like bot fly larvae that I won’t go near the things. I can’t eat them. Just the sight of the doughy little dumplings staring back at me from their Tupperware container in the refrigerator makes me want to run around the kitchen and flap my arms. In case you’re interested, I followed a gnocchi recipe I collected from a Williams and Sonoma catalog last year. It’s pretty good, and very easy to make, if you can get over the whole worm thing. Directions: Peel and prepare the potatoes as you would for mashed potatoes. Place the prepped potatoes in boiling water and cook until fork tender. When potatoes are ready, remove them from the boiling water and process through a potato ricer or chinois. It is important to have completely lump-free mashed potatoes. Meanwhile, in a large pot over high heat, bring 6 quarts salted water to a boil. Line a baking sheet with a lightly floured kitchen towel or paper towels. Mound the potatoes on a lightly floured work surface and make a well in the center. Pour the eggs into the well. Season the potatoes with salt, nutmeg and white pepper. Sprinkle 1 cup of the flour over the potatoes. Using a fork, gradually blend the eggs with the potato mixture. Using your hands, mix the dough, adding more flour as needed to form a firm but moist dough; do not overwork. The mixing process should take no more than 5 minutes. Divide the dough into 6 equal pieces. Roll each piece into a rope about 3⁄4 inch thick, flouring the work surface as needed so the dough is not too sticky. Cut each rope into 1-inch pieces and gently roll each piece on a gnocchi ridger. Place the gnocchi on the prepared baking sheet. Meanwhile, in a large sauté pan over medium heat, warm the tomato sauce. 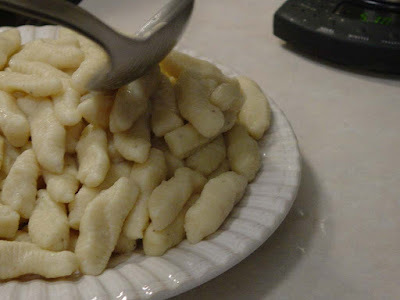 Working in batches, cook the gnocchi in the boiling water for 5 to 6 minutes. Using a slotted spoon, transfer the gnocchi to the pan with the sauce and toss to combine. Serve immediately. Serves 6.